Mallika Naguran plants new trees at Tanjong Tajam, Pulau Ubin and learns about tree species that are taking root at a destroyed area on Singapore's treasured rustic island. Singapore, 23 August 2014. One hundred trees were planted at Tanjong Tajam, west end of Pulau Ubin today. This was the first dig into a series of reforestation efforts to reverse the damage done to three hectares (ha) of burnt area that was once lush secondary forest with diverse flora and fauna. Destroyed by fire, 3 ha of Tanjong Tajam on Pulau Ubin is now being reforested gradually. A fire, triggered by a dry spell, had razed much of this once lush natural habitat “the size of four football fields” in Pulau Ubin to the ground on 28 March this year. The site is close to Outward Bound Singapore (OBS) premises. 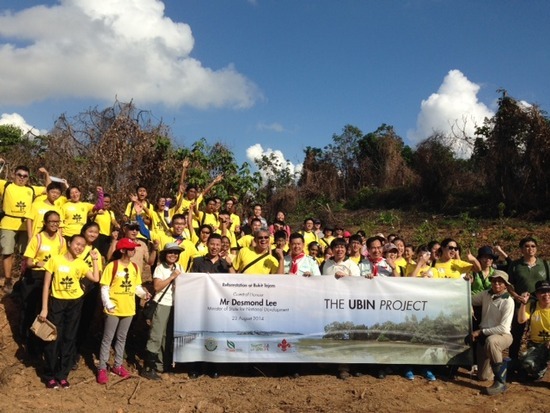 Leading the reforestation initiative was National Parks Singapore (NParks), along with the OBS Alumni, Singapore Scouts Association and the Friends of Ubin Network. Together, 0.1 ha of land was dotted with 11 young species of trees. MOS Desmond Lee plants a Pteleocarpa lamponga that had been extinct in Singapore, with the help of Robert Teo, Dy Director of NParks (right) and scouts. Officiating the reforestation kickoff was Mr Desmond Lee, Minister of State for National Development, who spoke of the need to restore what has been lost to maintain wildlife habitats on the island. “Ubin is a treasure trove of greenery and biodiversity, with many species of plants, birds, butterflies, dragonflies, reptiles and mammals, “ he said, including rare species. The once thought to be extinct Greater Mousedeer (Tragulus napu) was rediscovered on this island only in 2008. Rare wildlife is a treat on this island, if one comes across it. This includes the Leopard Cat, Small-clawed Otter, Smooth-coated Otter, Malayan False Vampire, Buffy Fish-Owl, Spotted Wood-owl and Great-billed Heron. Mr Lee was thrilled to plant a Pteleocarpa lamponga, native to certain Southeast Asian countries, but believed to be extinct in Singapore. It is a tree that has a bushy, open crown, growing up to 30m tall, with leathery leaves and yellow floral clusters at the end of leafy twigs. I, armed with a changkul (hoe), planted two tree species with Mr Sylvain Richer de Forges, Sustainability Director of Siloso Beach Resort and who founded Biodiversity, a web resource for nature lovers. Sylvain and I planted the Wild Cocaine (Erythroxylum cuneatum), also known as Baka or Medang Wangi and several other names, which will grow up to 45m tall, bloom tiny yellow flower clusters and bear bright red fruit that will be eaten by mammals and porcupines. Wild Cocaine can be found mostly in Pulau Ubin and elsewhere in Pulau Tekong, St John’s Island as well as Changi, where a heritage tree of this species stands. Not to be let down, we proceeded to plant another species. The Tampines Tree (Strebulus elongates), which once was abundant in a Singapore district that became named after it, is now classified as vulnerable. It grows up to 35m tall, have caterpillar-like flowers that grow at the leaf axils, and serves as an insect pollination base. Two Tampines trees are listed as Heritage Trees – one on St John’s Island, and the other at Changi. Rustic Pulau Ubin reminds us all of what Singapore used to be before urban development. According to NParks, this island harbours 600 native plant species (including at least eight not found elsewhere in Singapore), 27 species of mammals, 176 bird species, 34 reptile species, and 8 species of amphibians. “It is not for me or the government but for you and your children,” said Mr Lee to the youths who joined us in planting trees on that day, including the Wild Cocaine. 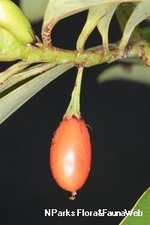 Red fruit of Wild Cocaine. The first agents of change in Tanjong Tajam reforestation, officiated by MOS Desmond LeeHe was not referring to reaping the harvest of this marvelous tree, but of how habitat enhancement through reforestation helps preserve our living legacy – the natural heritage. If you wish to get highs as we did from planting trees at Pulau Ubin, join OBS Alumni and NParks at the next reforestation event. Check out the Garden City Fund’s Plant-A-Tree programme or email garden_city_fund@nparks.gov.sg to find out more. Photos on site by Mallika Naguran and of flora courtesy of NParks. Watch a video of a rescued Malayan Porcupine being released on Pulau Ubin. Follow Mallika, Gaia Discovery's founder, on Twitter @GaiaDiscovery and Facebook Gaia Discovery page.